You try to swallow -- and wonder if you actually have anything to swallow with in this form, or that you are just imagining it. You try to take a deep breath -- and again, wonder if you actually need to breathe in this form. Then you decide it doesn't matter. Your friend Delar is marching towards the Dark Lord. The Dark Lord has a nasty trick up his sleeve that Delar did not -- does not appear to know about. The death-goddess said you are 'enmeshed' in this time, Delar's past... and you cannot help but worry that if you fail to support your friend, something awful is going to happen. You imagine Delar's ghost, hovering around the ceiling of this forsaken corridor with the others. Unable to leave. Ever. Slowly going mad. Still trapped. You reach out and accept the ghostly sword. The cold bites your hand, of course. The feeling of ectoplasm against your hand is disgusting. But still you seize the blade, and hold it ready. A longsword. You know how to wield a longsword. "I... give. You," the ghostly knight wheezes, his voice a painful death rattle that cannot lie down and be at rest. You feel xp, pouring into you, and for a moment you expect to level up. Then it shifts, and you realize the xp is being controlled by the ghost in front of you, a change in you is being wrought by the ghost, rather than your own will or the automagic field. It feels awful, the presence of the ghost somehow inside of you, your mind forced to share over a century of pain and sorrow, and the weary effort to maintain some semblance of sanity, hanging onto hope like a man hanging onto the edge of a cliff by his very fingernails. You are relieved when the ghost breaks contact -- and then you hear the voice of the automagic field, telling you what the ghost has done. You now possess your first Acquired Ability: a first level in an Apprentice Class. Apprentice Classes are not like normal classes; they do not allow you to choose powers to wield, and you cannot level up in them of your own accord. Instead, a mentor figure must give you the xp to advance, and the mentor gives you a single power, one they believe is appropriate. If you gain five levels in an Apprentice Class and gain enough xp to level, you can start taking levels in a class that connect to the Apprentice Class. In this case, the ghost knight has given you a level in Dread Squire. If you manage to find mentors willing and able to advance you to Dread Squire V, you will be able to advance in Dark Knight, Deathknight, or Knight of the Dead. Right now, though, you are just a Dread Squire I. Your mentor has given you the power Swordbearer. Swordbearer allows you to carry and wield your mentor's sword in his stead, provided he charges you to do so… and he has. That doesn't sound right. Your mentor has charged you to wield Grim Death, but the sword should still be his, not yours. So what gives? 'I am Grim Death. Wield me; I am yours,' the sword repeats. Clearly, it isn't much of a thinker. You still feel that something is off. Why has the sword shifted its loyalty to you? Come to think of it, where are the ghosts? Looking around, you don't see any of them. You still feel the chill they radiate, but they've either faded from visibility or hidden in the walls. None of them are hovering around you anymore, though. Do you even have time to worry? How long did the transfer of xp and the bestowing of your Apprentice Class-level take? Is Delar alright? "Uh," a little voice mutters. "Oh, dear. I... I don't think this was supposed to happen... yet? Or at all?" There are still no (visible) ghosts, but there is some sort of... floating… skull… thing hanging in the air in front of you. "Um, I think they ran," the skull says. 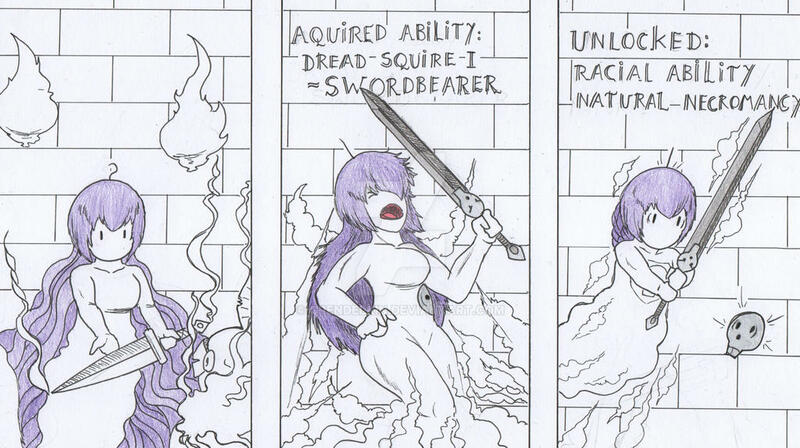 "When you took the sword, it tried to infest you with undeath, and your racial ability auto-activated to save you. That's why I'm here. Forced activation triggered me, too. Didn't expect that. But hey, uh, I'm supposed to guide you? Or something? The ghosts uh, 'spooked' when they saw it change the sword instead of it changing you." Racial ability? Infesting you with undeath? You changing the sword, instead? What? 'I am yours,' Grim Death repeats. CLASS ABILITIES: LIGHT ARMOUR PROFICIENCY. OVERSIZED WEAPON WIELDING. WEAPON PROFICIENCY - LONGSWORD. RACIAL ABILITIES: NATURAL CHRONOMANCY. NATURAL NECROMANCY. X. X. Time to fight the Dark Lord. There is no time to figure this out! Follow Delar! Would you like to join the vote?